Hello bloggers- greetings from the Oregon coast! My last post discussed the inherent dangers of living in the 'Ring of Fire' - the most tectonically active region of the world. Hopefully you weren't all scared away by the whole theme of natural disasters last time, but those of you who are still with me will get to read a much more hopeful post today! Now that you are all informed about the inherent risks of living and working near the beautiful Pacific Ocean, I thought it would be quite relevant to discuss what is being done to prepare for possible tsunamis, as well as what you can do in the case that you find yourself here during such an event. Oregonians do not take the threat of a possible tsunami lightly. Anyone that has traveled here has no doubt noticed the 'Tsunami Evacuation Route' and 'Tsunami Hazard Zone' signs all along Highway 101 and throughout town. The signs have grown into something iconic. Despite initial concerns that they might scare off weak-hearted tourists, they have in fact turned into a bit of a tourist attraction in themselves. The signs were initially developed via a Sea Grant project for Oregon only. However, the signs have caught on globally and now can be seen in various countries including Chile, Mexico, Japan, and Thailand. These are placed in low-lying coastal areas and alert people of possible danger. 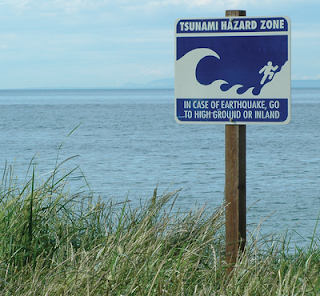 Other signs entitled 'Leaving Tsunami Hazard Zone' tell folks that they are leaving danger areas. Much is being done to prepare for potential natural disasters, and provide public resources. For starters, NANOOS (National Association of Networked Ocean Observing Systems) has a fairly comprehensive database and website regarding tsunami hazards. Their main tsunami map has an excellent map with warnings, advisories, and real-time info on earthquakes. Their map shows those zones that will be in danger during a distant earthquake (orange) and also those zones that will be in immediate danger during a Cascadia earthquake. The map has been completed for Oregon but no further as of yet. To see if your house or place of work is in a danger zone, type in your address. You can also use this to plan an evacuation route. Remember that a distant earthquake will generate a tsunami in a matter of hours, and a Cascadia earthquake will take minutes to generate a wave. The other resources on NANOOS' page include Preparedness, Warnings, Evacuation, Facts, and Travel/Propagation Time. NANOOS recommends that you are familiar with your local evacation route, and have an emergency kit ready. Also be familiar with impending signs of a tsunami, including a strong local earthquake (which could produce a tsunami in a matter of minutes), receding water, and the loud sound of an oncoming wave. Much like tornadoes, witnesses have described the roar of a tsunami to that of a train. NANOOS also has a free downloadable App (TsunamiEvac-NW) for your smartphone. Another useful resource for tsunami information is NOAA's West Coast and Alaska Warning Center. NANOOS' simple evacuation guide; Orange zone indicates far-away earthquake danger; Yellow zone indicates local Cascadia earthquake danger zone. In addition to this research, OSU's O.H. Hinsdale's Wave Research Laboratory has done numerous tsunami simulations and created several models of tsunamis. The most famous is of Seaside, Oregon, where a simulated local tsunami tore through the beach town (or a scale model of it) and gave researchers a better idea of how coastal communities could be affected. If you haven't heard of the lab or seen the video, I'd recommend checking out their website. They have some interesting photos and information, as well as live webcams of the wave pools (the largest in the world!). You can see the video of little Seaside being deluged here. Now remember that this is all just a factor of probability and chance, and there is a possibility that nothing will occur in our lifetimes. However, we are lucky enough to have such technology and knowledge on our side. With a little planning and advance research you can familiarize yourself with your tsunami risk, and arrange an evacuation route. Local communities regularly perform evacuation drills - one was just run last Saturday in Tillamook County- and it is a good idea to participate in these. Additionally, your business or organization may ran drills periodically. Keep in mind that most communities also have Tsunami warning sirens as well. These are tested regularly, so keep tuned in to your local news for notices. Most of all- don't worry, just be proactive! There is nothing we can do to prevent a tsunami or earthquake from actually happening, including worrying about it. Instead, don't hesitate to prepare yourself and your family for the case of a natural disaster- including tsunamis- and do what you can to stay informed and involved in your local community. Anywhere you live has inherent dangers- be it earthquakes, floods, tornadoes or tectonic activity- so you may as well live somewhere you love! I love the Oregon Coast, impending waves and all. ***To all interested: The Red Cross will be hosting a Tsunami Evacuation and Preparedness session open to the public at the Hatfield Marine Science Center's visitor center auditorium (Newport, Oregon) on October 26th from 2:30 to 4pm.